The story follows pathologist and crime investigator Toni Day as she is faced with a situation that most in her field only joke about – Beulah Pritchard comes back to life on her autopsy table. To save her career and the hospital, Day sets out on an investigation uncovering a decades-old scheme and must confront a vicious and clever murderer who will do anything to keep the past under wraps. 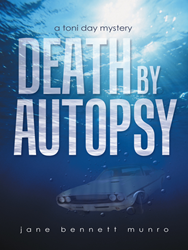 “Death by Autopsy” is an award-winning novel, having received third place in best mystery by the Feathered Quill Awards, is a five-star reviewed book on Amazon, and has received critical praise. Bennett Munro, who herself has nearly four decades in pathology experience, incorporates her own medical and forensic knowledge into her grisly descriptions of her book’s victims, offering readers a realistic and gritty story that will leave them riveted. Jane Bennett Munro holds a medical degree from the University of California, Irvine, and is certified in anatomical and clinical pathology. A hospital-based pathologist for 39 years, Bennett Munro has some experience working in forensics. She currently resides in Twin Falls, Idaho. To learn more, please visit http://www.janebennettmunro.com.